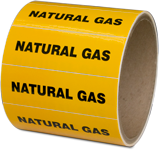 Natural Gas Markers on a Roll. Some areas of the country allow copper lines to be used for Natural Gas and LP Gas, as long as the lines are properly identified every 12''. 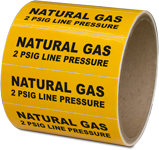 These labels comply with BOCA labeling codes for identifying Copper Gas & LP lines. 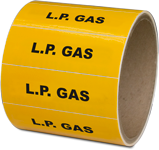 Convenient rolls of 100 (3 x 1'') labels. The most common legends are shownn here, click on any image to view options or to order.